Unhuman was founded as a noise project in 2012 in Athens with the release of his first tape, entitled Emperor Black on Species Productions and then a split tape with To The Lovers Farewell on Red Venice Records. Delving deeper into radical noise, experimental and industrial music, a whole new world of possibilities opened up to him when he moved to Berlin in 2012. After founding the Lärm-Alarm-Lärm festival, he combined the idea of underground music and more experiential events going onto organize workshops which encompassed experimental & interactive audio/visual performances in a project space called Shift which led to his current project Liber Null Berlin which unifies the freedom of arts in a conceptual event and a record label. 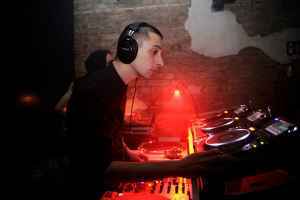 With his DJ-project he has performed alongside renowned artists such as Ascion, D Carbone, Eschaton, James Ruskin, Luke Slater, Makaton, Substance aka Dj Pete, Tomohiko Sagae, Truss, Ugandan Methods, Violet Poison. At the moment, Unhuman tours in venues all around Europe and Asia and is a regular act in many of the major Berlin clubs. He was resident Dj in the city of Paris for two years and now days he is resident artist at Constant Value Seoul. He released on labels such as Veleno Viola, Monolith Records, Amok Tapes and Instruments Of Discipline. Devour Wrath Without Shame sees Unhuman return to his original vision of dystopic noise, a pure, uncut vision of our darkest times, alive nightmares, everything we despise, unwanted and disconcerting, the rotting core of a concrete dimension.